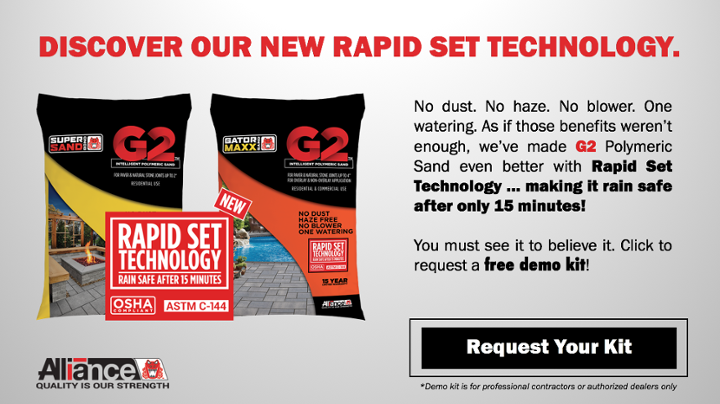 One of the commonly asked questions we get about Gator Supersand is why it can’t be used for pavers that have been installed on top of a concrete slab. In this blog post, we’ll explain the reasons why (and let you know what product to use instead). 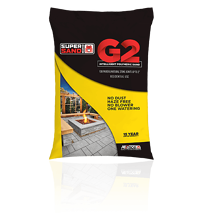 Gator Supersand is a high performance polymeric sand designed for concrete, wet cast, and natural stone paver applications. The regular version of this product can be used for joints of up to 1” and the new G2 version can be used for joints of up to 2”. This product is recommended for residential projects such as pool decks, patios, and walkways. While adding water to activate is a necessary step in the installation of polymeric sands, being exposed to constant moisture and saturation can present problems for the long term integrity of a polymeric sand installation. When polymeric sand is activated with water, it cures by drying. Alliance polymeric sands are designed to be rainproof in one hour above 32 degrees, however, they will not fully cure until they dry out. After that, every time the polymeric sand gets wet, it will soften. The degree of softening will vary between different products but all will harden up again as they dry out. Why can’t Supersand be used for pavers installed on top of a concrete slab? The softening and hardening cycle can happen a million times in a given application. Unfortunately, however, there are some situations where water cannot drain well … which will cause problems down the road. A concrete overlay application is one of these situations. When pavers are installed on top of a concrete slab, water cannot drain as well as in a traditional installation. This can cause the polymeric sand joints to stay wet for prolonged periods of time, which often damages and decreases the lifespan of the joint. So what product can I use for a concrete overlay application? Gator Supersand should only be used for residential non-overlay applications. Gator Maxx is specifically designed for concrete overlay applications but excels in traditional, non-overlay applications as well. For more information on this topic, be sure to check out: How do I know which polymeric sand is right for my application?